Utream.tv started life as a Plain Jane live streaming service provider, competing with Livestream, the now­departed Justin.TV, Bambuser, and ultimately YouTube Live. 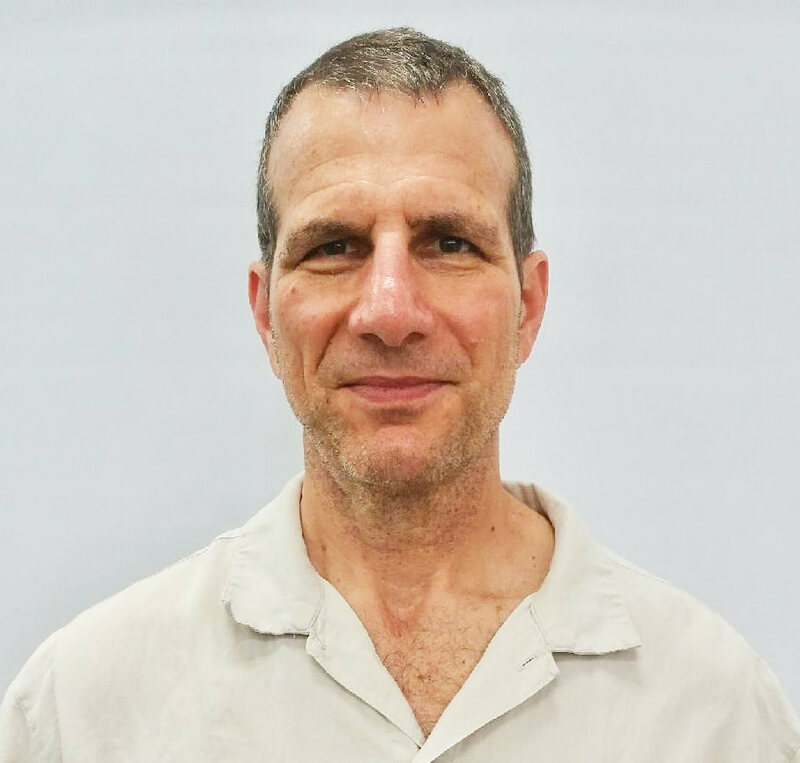 Since then, the company has evolved into a full­service online video platform for both live and VOD content, which the company calls Ustream Pro Broadcasting. The company has also introduced two vertical products; Align, a more secure platform for enterprises and teams, and Demand, a lead­generation product. The best way to consider the products is like this: Pro Broadcasting includes the platform for broadcasting live events, uploading and encoding VOD content, creating the player and channel page, and managing and embedding videos. Align provides most of the same functionality, with increased security and authentication options and analytics. Demand bolts onto the Pro Broadcasting product, adding the ability to force users to register before viewing your videos. I’ll describe Pro Broadcasting first, then Align, and then Demand. Ustream offers an ad­supported free trial, and advertising­free plans that start at $99/ month. Plan specifications are available on the Ustream site. I tested using the Demand plan, which included five channels. 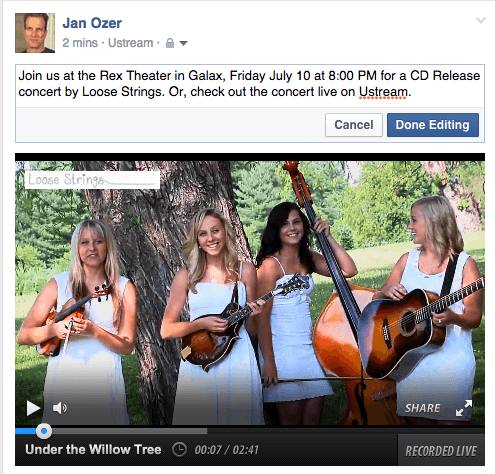 I used two: the Streaming Learning Center channel, and the Loose Strings Concert Channel, which I set up to stream a concert for the Galax country music group on July 10, 2015. This is shown in Figure 1. As with all live streaming service providers, you can watch Ustream videos in multiple places, including the channel page, or the page for the channel on the Ustream site, or on any website via an embed code. In the Ustream Channel page, there is Ustream branding above the player; in the embedded videos, there is none. Plus, I was able to customize the player with the Loose Strings picture on the top left and the logo on the lower right of the video window. Additional customization options include the ability to choose a background color or image, which I experimented with, but ultimately didn’t use. You can also control whether a social stream of messages from Ustream chat, Twitter, and Facebook is available in the player. For more extensive customization, you can use Ustream’s IFrames feature to customize the size and appearance of the player within the channel page, which I did not test. Ustream offers three configurations for your embedded videos: just the video, just the social stream, or a larger configuration with player, social stream, and video gallery. This flexibility is useful; most other services limit embedding to player only, forcing viewers to visit the channel page to access additional videos or leave a comment. Ustream also enables embedding into Facebook, which includes the logo and no Ustream branding, which you can see in Figure 2. After creating the channel, I scheduled the concert in the Ustream system, so notice of the event appeared in the video window of both the channel and all embedded pages. I also enabled email capture, so those who planned to attend could sign up for a notice by filling in their name and email address. At the bottom of Figure 1, you see links to two CDs, which I created using Ustream’s extensions feature. Here you can include links to products on Amazon and iTunes, connect the broadcast to your Facebook page, solicit donations via PayPal, and create custom links to other websites selling products and services. Extensions are a very simple way to help monetize your events. Speaking of monetization, Ustream formerly had a pay­per­view option which was shut down on Oct. 1, 2014. You’re free to disable the channel page and direct all viewers to watch via your own webpage and paywall. Or, you can use pay­per­view provider Cleeng, which I did not test. 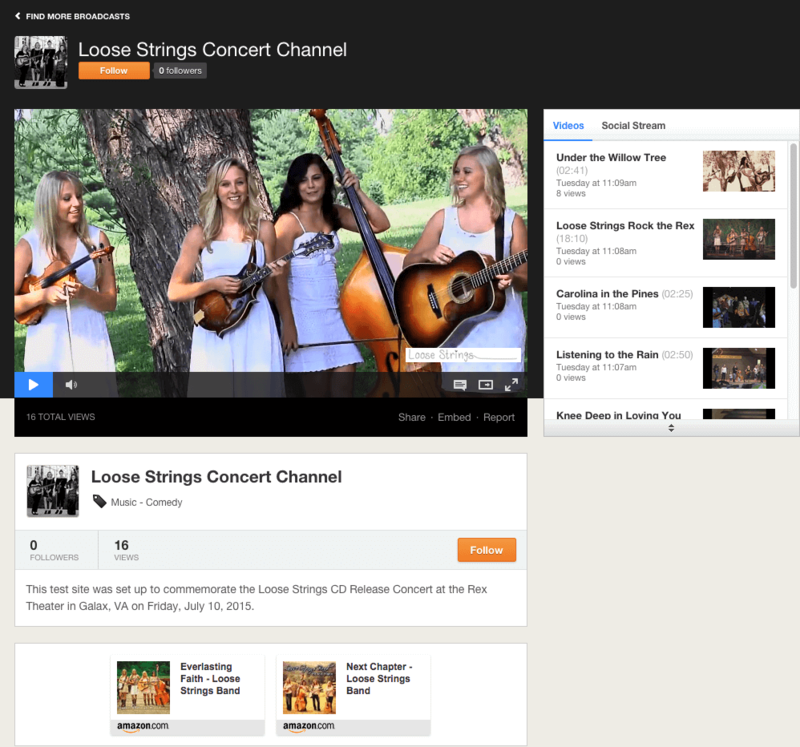 To create instant interest in the channel page, I uploaded eight concert videos of the group into the channel’s video manager, which is Ustream’s content management system. The videos I uploaded are shown on the right of Figure 1, and at your option, recordings of all your live streams will be added to this gallery. 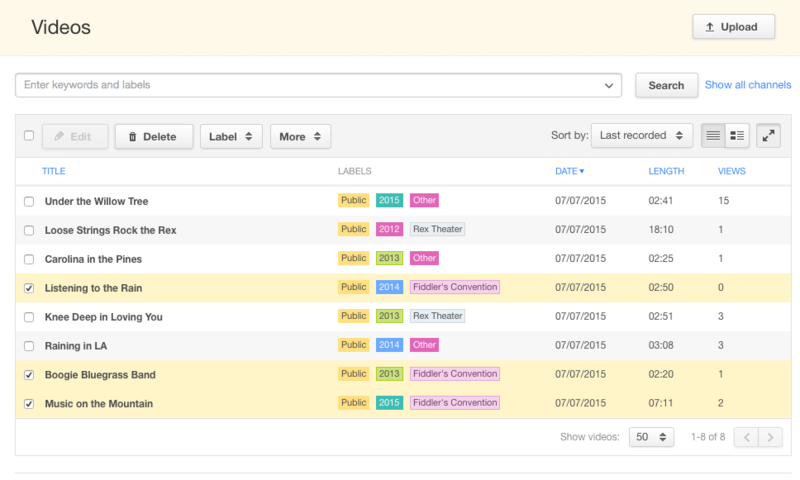 The video manager (Figure 3) uses a file manager-like interface that’s easily sortable by columns. There’s a flexible search function that lets you easily find and select groups of videos, or administrative functions, such as copying to a different channel, or deleting the videos. Once uploaded (or recorded and inserted into the gallery), you can create multiple highlights from the video by specifying multiple input and output points, so you could divide a concert into individual songs, or a lecture into individual sections. Within the video manager, you can also trim any video, upload it to YouTube, grab an embed code, change the metadata, and delete the video. In an account with multiple channels, all videos from all channels are stored in a master video manager, which makes it easy to share videos among the different channels. This is particularly useful within the context of Ustream’s enterprise product, where different channels within an organization will likely need to share videos. The one major deficit is a limited playlist function that lets you group multiple videos into a single presentation. In a public site, this is great for stickiness; the hope is that viewers will click from one video to the next. In an enterprise, it’s a convenient way to group several training videos into a single presentation; for instance, the five videos you have to watch when onboarding. With Ustream, you have two playlist options. First, you can create playlists of videos to stream on a scheduled basis from your channel when you’re not live. Or, you can create one playlist per channel, which contains all non­private videos in that channel, which is what you see on the right in Figure 1. This will work in some instances, but since channels are a limited resource, a more flexible playlist option enabling multiple playlists per channel would be a nice addition. Beyond disabling your channel page on Ustream, you can restrict the embedding of your videos to specifically identified domains. When you’re not streaming live, you can control the experience of visitors to your site or embedded page, either automatically playing through the last recorded video, the aforementioned playlist of selected videos, or an image slideshow. Ustream allows fans to follow your page, and you can see the identity of all of your followers. Your player can include links to Facebook and Twitter, and you can specify the default messages for both services. One of Ustream’s strengths is that it’s an accessible, open service. You can quickly and simply go live via a Flash­based capture screen, though Flash Player doesn’t deliver optimal quality. You can use most commercial hardware and software tools to broadcast to Ustream, and I did much of my testing and broadcast the concert with the Teradek VidiU Mini connecting to Ustream through the 4G capabilities on my iPhone. Ustream offers a custom version of Telestream Wirecast that you can download for free for 30 days, and the trial version includes features such as playlists and a Twitter feed, which you can read about in my Wirecast review. However, the trial doesn’t include HD or multiple camera broadcasting, or the local recording to your hard drive. Thereafter, Producer Studio costs $279, enabling HD, multiple camera, and local recording, while Producer Pro costs $549 and adds instant replay, scoreboard functionality, and audio mixing. Ustream’s default schema for live streaming is in­the­cloud transcoding, where the publisher sends in a single stream, and Ustream automatically transrates the stream into multiple streams for adaptive delivery. Note that you can’t configure the separate streams within the Ustream system, though most users won’t really want to. With some account levels, you can encode your own adaptive streams, but you’ll need an onsite (or other cloud) encoder plus much more outbound bandwidth than Ustream’s default schema requires. Ustream will join other IBM acquisition targets—Clearleap, Cleversafe, and Aspera—in comprising an end-to-end cloud video solution. As part of its shift away from free streaming and toward enterprise customers, Ustream releases a platform with greater control. At NAB 2014, Ustream explains that it's seeing huge growth in the enterprise, and it understands the needs of large, multi-department companies.